We’ve been a bit tardy with the Thai recipes (promised in December—yes, that long ago), but before we start, we’ll recap with a visit to our earlier post on Cooking Thai 101 where we outlined the basics you need in your kitchen before you start your adventure with cooking Thai food. 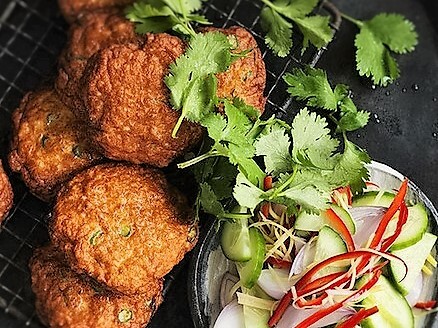 One of our fave Thai foods is Thai Fish Cakes and part of our sojourn into authentic Thai cooking—with Silom Thai Cooking School—was to learn how to make them, and surprisingly, they’re not as tricky as you might think. So grab your ingredients and your wok or frypan and Let’s Cook Thai! What you need: 500 grams finely chopped white fish such as ling or mahi-mahi, or you can use salmon steaks, 5 kaffir lime leaves rolled and cut into thin strips, 1 tablespoon red curry paste, 1 teaspoon good quality Asian fish sauce, 1 teaspoon sugar, 1 tablespoon corn starch, 2 long beans or large green beans thinly sliced on the diagonal, 1 egg, and oil for frying. We choose to shallow fry in coconut oil but any good quality vegetable oil will do. What you do: In a large bowl mix all ingredients together by hand, then take two tablespoon of mixture and shape into small flat patties. Heat oil and fry patties until golden brown turning once. And that’s it! 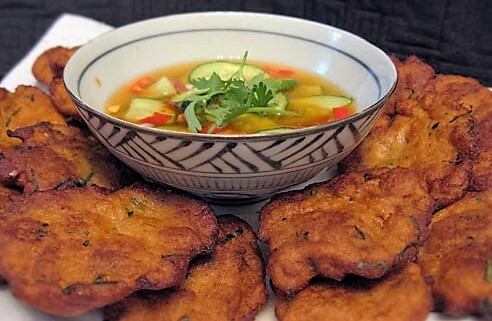 Serve with dipping sauce and a crisp Asian salad. What you do: Combine all ingredients together and mix well—this is best done in a jar with a sealed lid so you can give it a really good shake, then set aside for 10 minutes, then shake again. Repeat until the sugar has dissolved and store in the fridge. The sauce will keep for a couple of weeks. 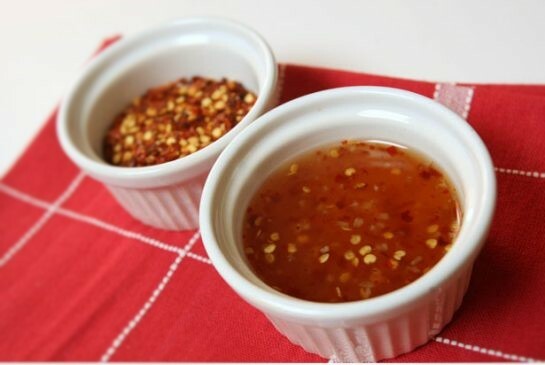 What you need: 2 tablespoons rice vinegar, 2 tablespoons freshly squeezed lime juice, 2 tablespoons fish sauce, 2 tablespoons hot chilli sauce (see above), 2 tablespoons crushed unsalted peanuts, and 2 small cucumbers peeled and sliced. What you do: in a jar, mix together the vinegar, lime juice, fish sauce, chilli sauce and peanuts and shake well. Pour into a small bowl and add the sliced cucumber. Serve immediately. *And, here’s Awesome Jay’s tip on squeezing limes. Cut your limes in half and squeeze the lime while running it against the flat rim of a knife (not the sharp side) over a small bowl. The lime juice will run down the knife and into the bowl—voila, no mess, no lime pulp, and no lime all over your hands. Cool eh? This entry was posted in LFW Food&Wine and tagged chilli dipping sauce, hot sour sauce, Silom Thai Cooking School, Thai fish cakes on April 11, 2016 by gracienumber1.